Galatasaray Liv Hospital Istanbul made its return to the Turkish Airlines Euroleague memorable by hitting the road to beat Montepaschi Siena 75-84 on Wednesday at Nelson Mandela Forum in Florence, Italy. Galatasaray used hot shooting in the first half to build double-digit leads that it protected the rest of the way. 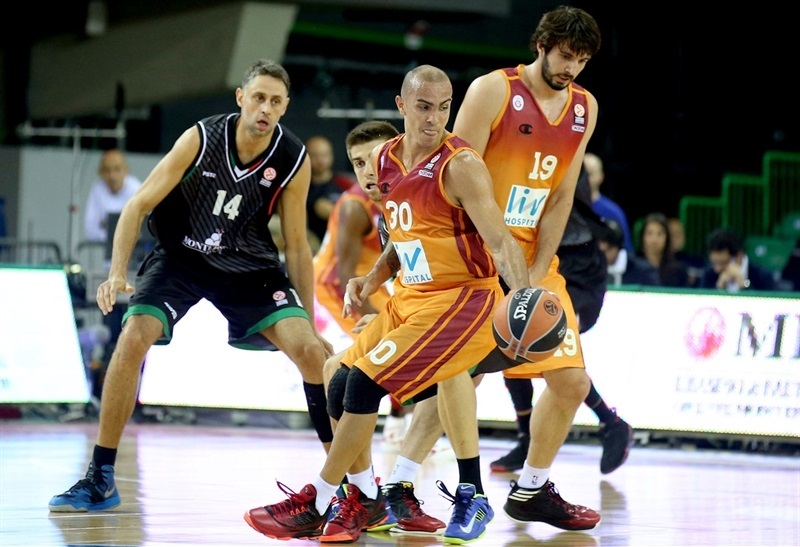 Carlos Arroyo paced the winners with 21 points, followed closely by Jamont Gordon with 18. Zoran Erceg posted a double-double of 15 points, 11 rebounds, while Henry Domercant scored 11, Furkan Aldemir 8 to go with 9 rebounds. Daniel Hackett was Montepaschi's go-to guy all night, finishing with 26 points on 10-for-11 two-point shooting, while Erick Green added 14 and Jeff Viggiano 10, but it wasn't enough for their team to prevail in its first game on a new homecourt. Galatasaray's red-hot 9-for-14 three-point shooting in the first half gave it a huge 18-point cushion, 33-51 at halftime. 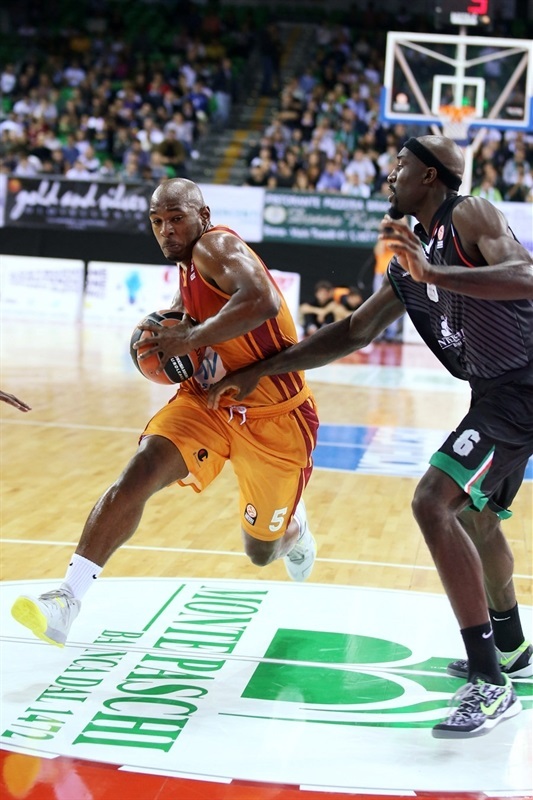 Montepaschi scored the first 8 points after the break, but the visitors still led by double-digits after three quarters, when Galatasaray had just 3 turnovers. Montepaschi would get as close as 71-78, but there was only a minute left, then, too little time to complete a rally. 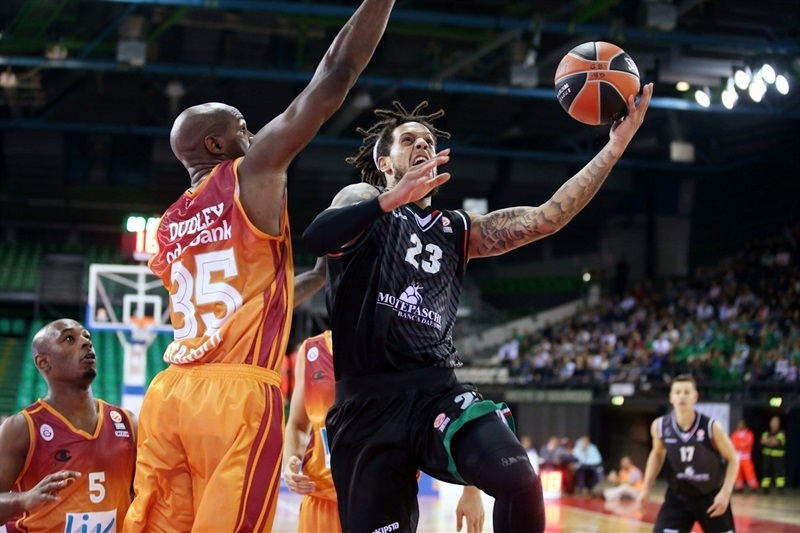 Erick Green got the fans in Florence on his side with a three-pointer to start the game but it didn't take long for Montepaschi's offense to stall while Zoran Erceg's inside bucket put Galatasaray in front 5-9. Neither team could find the basket for awhile until Hackett's second-chance basket broke the spell. Erwin Dudley put back a shot blocked by Ben Ortner to keep Galatasaray a step ahead. Othello Hunter entered with a much-needed basket for Montepaschi that Green followed with a lane jumper. Dudley answered with a strong put-back before Gordon went coast-to-coast for Galatsaray's biggest lead yet, 11-17. Green copied that fastbreak, setting up a big first-quarter finish. First, Dudley fed Erceg for a stand-alone triple, but Green raced the other way to beat the buzzer from the arc, cutting the differnece to 16-20 after 10 minutes. Erceg started the second quarter as he ended the first, striking from the wing. Hunter answered with a two-pointer, but Gordon got open on the same wing to triple-shoot Galatasaray into a new high lead, 18-26. Hackett ended another Montepaschi scoring drought at the free throw line, but Arroyo answered with a jumper over Tomas Ress. Beautiful ball movement got Henry Domercant his first points on a triple, while Hunter flushed a nice pass from Hackett at the other end to make it 22-31. Taylor Rochestie climbed off the bench for a quick triple, and when Arroyo answered from the arc, Ress copied him. Arroyo liked the challenge, crossed over, and hit another outside shot, but his foot was on the line. Aldemir crashed for a third-chance rebound that meant the game's first double digit lead, that Domercant upped with a triple to 30-42. 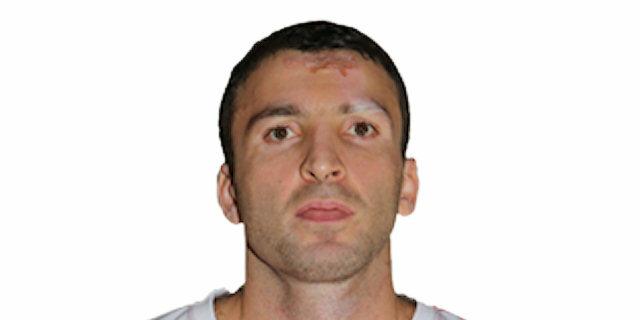 Two new outside shooters, Jeff Vigiano for Montepaschi and Cenk Akyol for Galatasaray, took their turns shooting threes. Then the shoot-'em-up continued with another from Erceg and a final triple to end the half from Gordon as the visitors rocked in front by 33-51 after 20 minutes. Hackett sparked Montepaschi with a tiple right after halftime that Spencer Nelson quickly copied. When Green next went coast-to-coast, the difference was suddenly back to 10 points, 41-51, and Galatasaray needed a timeout. Arroyo rescued the visitors with a killer baseline turnaround. As in the first two quarters, the scoreboard stuck there for awhile until Hackett scored in the lane and Manuchar Markoishvili replied for Galatasaray. Kim English drove to get Montepaschi within 45-55. The teams kept trading 2 points at a time until Aldemir made his a three-point play at the foul line for a 47-60 advantage. 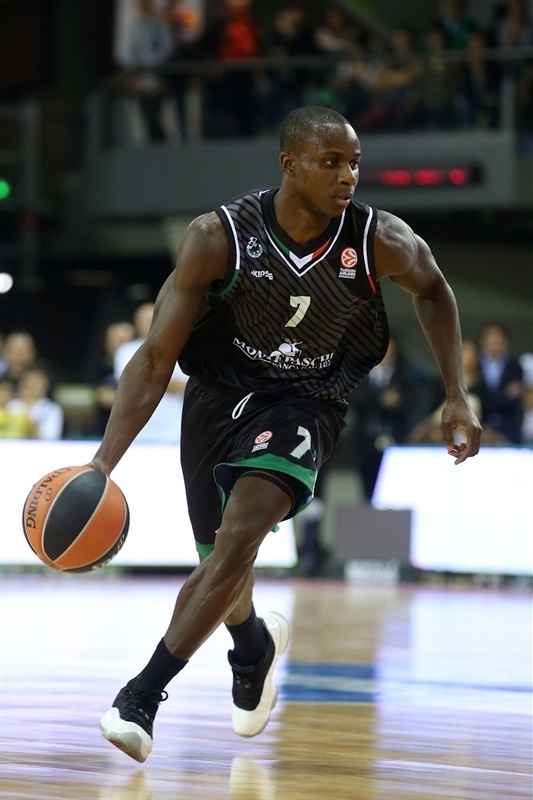 When Gordon launched a three-pointer, Galatasaray was almost back where it started the second half, but Viggiano's fastbreak dunk and Hackett's three-point play gave Montepaschi hope again at 52-63 after three quarters. Gordon's basket to open the fourth quarter was answered by Viggiano from the arc. But 5 seconds later, Domercant did the same for Galatasaray. Dudley missed a dunk but put it back while Hackett made a jumper. When Arroyo crossed over and beat the shot-clock, Hackett answered, but the shots just kept falling for the visitors, with Domercant making it 59-75. 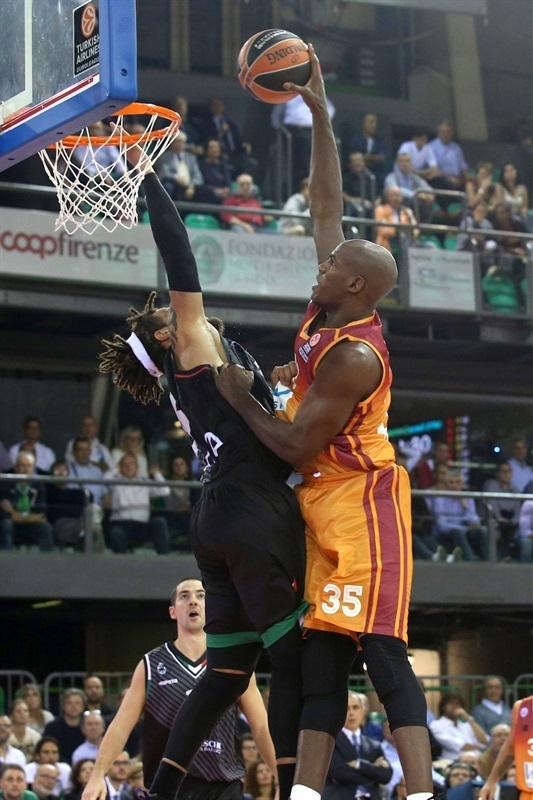 When Nelson dropped a three and Hackett finshed at the rim again, Montepaschi was as close as 64-75. Aldemir upped the difference with free throws, David Cournooh floated for a bank shot for Montepaschi, and Arroyo's foul shot made it 66-78. Green scored next on a fastbreak, and then Tomas Ress ended the next transition with three-pointer to make it 71-78 with 1 minute left. Hackett kept charging for points, but Galatasaray kept hitting its free throws to hold onto a huge debut road win. "We have five minutes of regret from the second quarter. Then we won the third and last quarters. 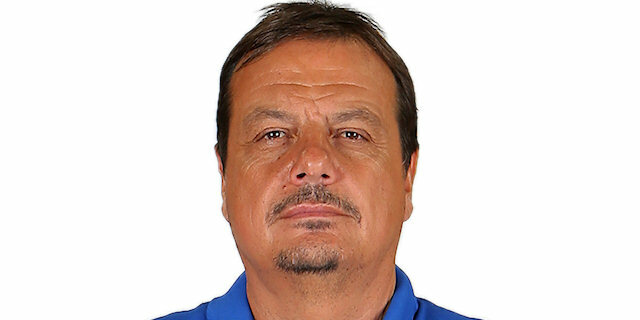 Galatasaray is a team of great players who played a great game. In the second half we showed that we can fight. This fact is certainly very positive in view of the upcoming games." "We started the game very well, perfectly as we had prepared . We knew that Siena would attack our pick-and-roll , doubling on Arroyo and Gordon. We made good use of the space on the court and we found the right shots . We defended well in the first half against Carter and Hackett. 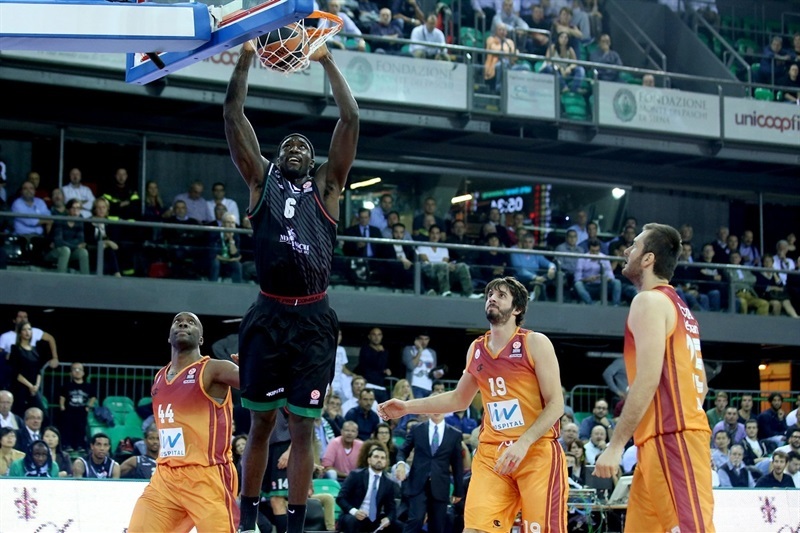 Then we were able to defend against the aggressiveness of Siena, who tried to come back." "It was my first game back from injury. I helped the team as much as I could, especially on defense. I am particularly pleased with the victory."